League 2 leaders Annan were held to a 2-2 draw by visitors Arbroath with both managers­ unhappy at the end of the 90 minutes. Peter Weatherson opened the scoring for the hosts ten minutes from the break and Annan grabbed a second on the hour mark through Smart Osadolor. Bobby Linn pulled a goal back before Greg Rutherford headed an equaliser. New Berwick boss John Coughlin found out how hard his job is going to be at Shielfield as a David Gormley-inspired Clyde sent the Borderers to the foot of the table with a 5-0 win. Gormley, pictured, thumped home the only goal of the first half from 18 yards and he made it 2-0 five minutes after the break. Scott Linton headed a third goal on 58 minutes before scoring twice in the final eight minutes. 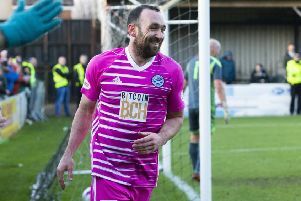 Elgin City won at home for the sixth time this season when they saw off East Fife 4-2. ­Brian Cameron slotted the ­Borough Briggs men in front after 35 seconds and Craig Gunn tapped in a second with four minutes played. The Fifers rallied and were level by half-time thanks to goals by Kyle Wilkie and Nathan Austin, but Elgin won the spoils after the break when Darryl McHardy headed in and Daniel Moore netted a free-kick. Queen’s Park beat Stirling 1-0 thanks to a second-half goal from substitute John Carter, with East Stirling moving up the league following a 3-1 ­success over Montrose.